Need a cute dessert for your holiday party? 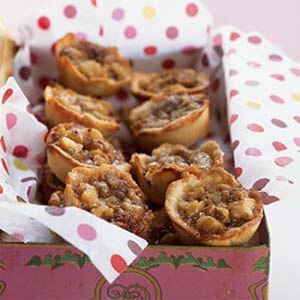 You can't go wrong with these Orange-Walnut Tassies, which look like tiny pies. Added bonus? They're just 78 calories each and use vitamin C-rich oranges, so no need to feel any holiday guilt if you serve (or eat) them. The dessert cuts fat by using 1/3-less-fat cream cheese and fat-free milk in the mini crusts. The filling is loaded with fresh citrus from the oranges, brown sugar, and walnuts, which add texture, crunch, and heart-healthy monounsaturated fat. Plus, they're simple and easy to make! These are perfect for a before-dinner appetizer, or after-dinner sweet with coffee.